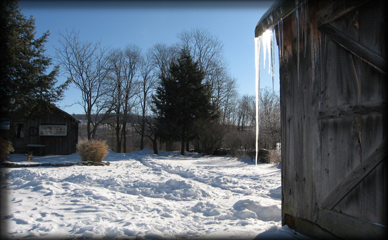 This icicle melted and grew till the last day of February – then, it leapt from the roof! 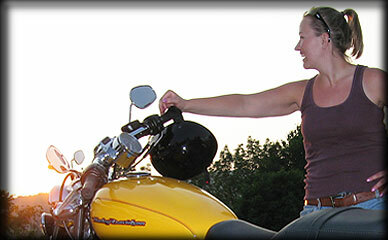 Kim Ryon, a Harley-Davidson “Get Down to Daytona Contest” winner, is headed to Daytona for Bike Week 2008. We wish her happy trails as she rides through the urban splendor of Atlanta to the sandy beaches of Daytona, adventure unfolding with each stop along the road! Congratulations Kim – enjoy this trip of a lifetime! 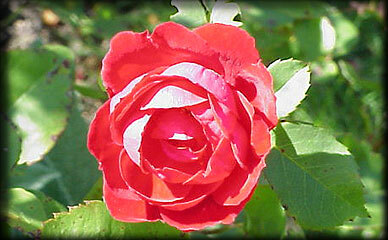 Valentine’s Day brings thoughts of warmth and roses. This rose grew along the walkway to Oliveri’s Crystal Lake Hotel Lakeside Cafe, on a warm summer day. Why not make dinner reservations at Oliveri’s Crystal Lake Hotel this month (or even Valentine’s Day) for you and your best friend? This time of year the Lakeside Cafe is not open, Crystal Lake is frozen over, there’s not a rose outside to be found. Amidst the ice of winter, you and your friend will find the Oliveri’s hospitality as warm and inviting as the day this rose was blooming.